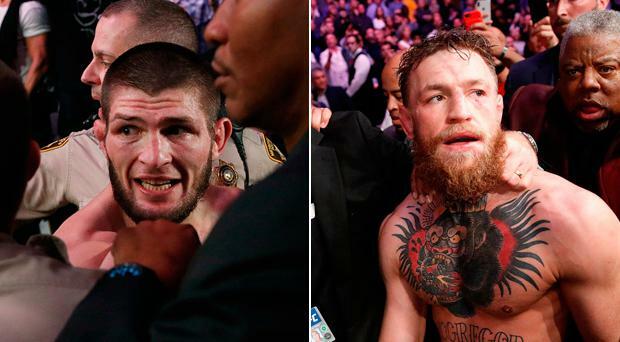 Conor McGregor's much-anticipated fight with Khabib Nurmagomedov descended into chaos after the Russian instigated a mass brawl following his stunning defeat of the Irishman at UFC 229. McGregor's mixed martial arts return after a near two-year hiatus fell flat as he tapped out midway through the fourth round, but Nurmagomedov soured a career-best performance with his actions immediately afterwards. The Russian, whose victory meant he retained his lightweight title, threw his gumshield, vaulted the cage and attacked someone from McGregor's camp. While that was happening, McGregor was set upon and attacked by at least two men who entered the cage as the bad blood between the camps came to a head. Nurmagomedov expressed his regret at what had unfolded but showed his disdain for McGregor's behaviour leading up to the fight, including the notorious bus attack in April that left several rival fighters injured. So just how did it all come to this? On April 4, 2018, at a UFC fight event in the Big Apple, a video was made public of an altercation between Nurmagomedov and Artem Lobov, of Russian-born fighter but also a teammate of McGregor who has lived in Ireland for many years. Lobov is also a UFC fighter. Lobov had told Russian media how his countryman "didn’t give a s*** about his fans" and that 'The Notorious' was the real champion. Nurmagomedov responded by getting in the featherweight's face before appearing to slap him on camera. It is this slap that is believed to have made McGregor jump on a plane to New York to confront Nurmagomedov. McGregor admitted: "Artem has done a lot for me over the years and that (the confrontation) was a big turning point. "When it (the confrontation) all happened, it was a low move so that was it." At the pre-event news conference for UFC 223, president Dana White revealed McGregor would be stripped of his lightweight belt for failing to defend it since the night he claimed the title in November 2016. The day after, McGregor and his entourage, including Lobov, stormed into the Barclays Center, Brooklyn. McGregor attacked a bus full of UFC fighters, with Nurmagomedov on board. McGregor seized a metal dolly and threw it at the bus, breaking a window, with broken glass injuring Michael Chiesa and Ray Borg. The two fighters were unable to compete. Later that night, McGregor turned himself into police custody, after a warrant was put out for his arrest. “This is the most disgusting thing that has ever happened in the history of the company,” said White at the time. Nurmagomedov went on to win a unanimous decision over Al Iaquinta on the Saturday night to become UFC lightweight champion. And a bitter feud with McGregor had started. In July, McGregor accepted a plea deal in a New York court of "disorderly conduct". He was fined and ordered to perform community service, attend anger-management classes and pay damages for the bus. The plea meant the Irishman avoided a jail term, vital if he was to keep an active fight licence in the USA. Nurmagomedov was furious. In August, White announced that McGregor and Nurmagomedov would fight for the belt in Las Vegas. And on September 20, at a news conference at Radio City Music Hall, New York, there were, unsurprisingly, chaotic scenes as McGregor hurled insults at the champion. McGregor claimed Nurmagomedov would be "dead right now" if there had been a confrontation between the pair in April when the Irishman hurled the metal dolly at the bus. "I came back for the love of this, to come and shut this man up - a little rat, a little weasel, a little hard man in groups. A man who grows in numbers but on his own and when confronted in a similar situation cowers away. And that's what you saw with that little s**** on the bus. He s*** his jocks." "Did you not see me outside the bus? I showed you my hands - no weapons. "To let him know I came unarmed. Step off the bus. You talked the big game, now I'm here. He done f****** nothing. He sat and took a s*** on that bus. Hid and cowered behind f****** women and caused what happened to happen. "I just thank the Lord Jesus Christ that that man had not got the balls to step foot off that bus, or that the bus door did not open, because if that bus door had opened, this man would be dead right now. He would be in a box and I would be in a cell and we would not have this great fight ahead of us." "It's personal, but it's the same. It's always a little personal, but in there it's a blank face and a new body. "I see him turning into a bobblehead when I hit him. I feel his brain is going to rattle when he gets a clatter off me. That's what I'm keeping in my head. "But I am a veteran now. I will be prepared for five rounds. I will be prepared for any scenario. that's it. I'm well trained, I put in the work and we're confident wherever it goes." "You're in for a show, trust me on that. I'm going to take his head off. Trust me. (It will be a) devastating KO. (Nurmagomedov is) too easy to hit, too flat-footed, too predictable, I'm going to knock him clean out. "I don't give a f*** about anything. Any wrestling, any technique, any anything. I'm coming for that man's head from the f****** bell. "It's good to be back. Let's go do it. A proper fight, a proper, proper fight." "These guys (Irish) talk about (how) they fight English people but his grandfather worked with the English navy. Now you support (his grandson)? I'm going to change this. "I have a question for Ireland. What about your language, what about your Irish language? Where's your language? What's wrong with your language? "Are you guys right now with England, you guys change your language. Give me answer someone if you can. It's very interesting." Nurmagomedov stormed out of the media conference at their final press conference in response to the Irishman not turning up on time. McGregorarrived almost 25 minutes late, about 10 minutes after the Russian champion had left the stage. The 30-year old Nurmagomedov had strode out on the stage to start the press conference on time, sending UFC president White scrambling to get things started, rather than wait for the Irish challenger. "Three PM, this conference is beginning. I wait for no-one," the Russian said, before asking the media to start their questions. He left 15 minutes later with still no sign of McGregor, and promised to exact his revenge in the cage on Saturday, saying: "For me this is more than defending my title. For me it's personal." Not long after, McGregor was on the stage, blaming the Las Vegas traffic for his tardiness before unleashing a torrent of invective about Nurmagomedov and his entourage. "My heart is black toward this man, towards his team, towards his people," McGregor. "I plan on knocking that man's nose right into the nosebleeds. That's what's going to happen on Saturday night." McGregor attempted to take the attack to Nurmagomedov the day before their showdown. The pair both made the 155lb limit on Friday morning but tensions threatened to boil over when, as they got into their fighting poses, McGregor brought his arms down on Nurmagomedov before aiming a kick at his bitter rival after being beckoned forward by the Russian. Nurmagomedov seemed unflustered by the antics or another barracking from a crowd largely supporting McGregor, whose entourage on to the stage at the venue included the rapper Drake draped in an Irish flag. McGregor made one last attempt to charge at Nurmagomedov but the fighters were held back from each other by a throng of security personnel. McGregor was forced to submit to his rival's rear-naked choke midway through the fourth round in Las Vegas. Nurmagomedov therefore retained his lightweight title but then threw his gumshield, mounted the cage and looked to attack someone from McGregor's team. A prone McGregor, still sitting on the floor after his defeat, was apparently attacked by someone from Nurmagomedov's camp as the bad blood that has been building up ahead of this fight came to a head. Both fighters had to be escorted from the arena by police and security. No belt was presented and no speeches made, but the ring announcer declared Nurmagomedov the winner to a chorus of boos from the McGregor-supporting crowd. There are also multiple reports of scuffles and fights breaking out on the main strip in Las Vegas. UFC president White reveals he opted not to give Nurmagomedov the lightweight belt for fear McGregor's fans would react badly. A stunned White tells Fox Sports: "A lot of bad stuff and stuff that shouldn’t happen. "Three of Khabib's guys have been arrested. They are on their way to jail. There will charges filed against them I'm sure. These guys may never get a visa to get back in the country. "I just spoke to Bob Bennett from the Nevada State Athletic Commission, he said they have looked at some stuff already and they have made the decision that they will not withhold McGregor's cheque, but they are withholding Khabib's." It is revealed that McGregor is not pressing charges and White is forced to defend his handling of the fight. "We did more than anything we have ever done to stop this kind of thing happening. What can you do when someone climbs over the cage like a monkey... The (security) team did a great job of containing this tonight. "It is a bad night for me and for people who have covered the events. We know that this is not what the sport is about. I am not in a good mood right now. "I'm so disappointed. I'm one of the guys who has worked 18 years to get this sport where it is today. It is super personal to me. I have worked so hard for so long. It is just so disappointing. It should have ended with Khabib walking out a champ but it didn't." The Russian reveals Vladimir Putin called to congratulate him... and claims the brawl occured because McGregor disrespected his father, his country, him, and his religion. "First of all I want to say sorry to Nevada Athletic Commission and second to Vegas. I know this is not my best side. I'm a human being. But I don't understand how people can talk about how I jump on the cage. He talked about my religion, he talked about my country, he talked about my father. "He came to Brooklyn and he broke a bus, he almost killed a couple of people. What about this s***? Why do people talk about me jumping over the cage? I don't understand. "He talk about my religion." "He talk about my country." "He talk about my father." "Why people talk about I jump over the cage?" White acknowledges the UFC might strip its title from Nurmagomedov (27-0). "If he gets suspended, it depends on how long his suspension is. And if it's a long suspension, yeah, he's probably going to get it stripped." Former heavyweight boxer Mike Tyson even claims the brawl outdid the night he bit off part of Evander Holyfield's ear in 1997. "Unimaginable never thought it would go down like this," Tyson said. "Crazier than my fight riot." British MMA fighter John Maguire suggests there might be a more cynical motive behind the drama. "Don't worry people it will all be forgotten about in a couple of weeks and then there will be a even bigger build-up for a rematch," he said. Probably. There is now even more interest. And McGregor says he is ready to fight Nurmagomedov again. "Good knock. Looking forward to the rematch," he tweeted afterwards.